Oscillators are stock trading indicators that are used when charts are trading sideways or horizontally. Traders use them when they can’t clearly determine a trend. Therefore, these oscillators are commonly used by day traders and swing traders to determine upcoming trends in a stock.They are used to determine when stocks reach overbought or oversold levels to measure whether the stocks next trend will be up or down. The two most popular Oscillators are the MACD and the RSI Index. MACD is best used as a trend or momentum indicator, while RSI is best used to determine overbought or oversold conditions. You can read our guide on the RSI Index here. An important thing to remember is that Oscillators such as the MACD should be used in conjunction with other technical indicators. These are relatively simple indicators and trading with just these simple indicators would be way to easy of course. 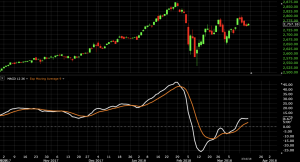 What is Moving Average Convergence Divergence (MACD)? Moving Average Convergence Divergence, referred to as MACD, or “mac-dee” is a momentum indicator used to determine the next trend a stock is going to take. The indicator shows the relationship between the 26-period Exponential Moving Average (EMA) and the 12-period EMA. Subtracting the 26-period EMA from the 12-period EMA creates the MACD Line. Here is an image of the two EMA trend lines plotted below the candlestick charts. From here, a 9-day EMA of the MACD creates the “Signal Line” and is plotted on top of the MACD Line. In short, the MACD formula = 12-period EMA – 26-period EMA. EMA’s differ from Simple Moving Averages (SMA’s) in that it places a greater weighting on the most recent data, and less weighting on older data. AKA it is more affected by recent price changes. Blue Line = MACD. This is the 12-period EMA minus the 26-period EMA. Orange Line = Signal Line. This is the 9-day EMA of the MACD. Red Line = Base Line. This is always at zero. Now let’s introduce a histogram, which is commonly shown in conjunction with MACD charts. As mentioned above, MACD Indicators are relatively simple to identify. If we could just buy or sell at a crossover, every day trader would be a millionaire! With that being said, we need to use these indicators in conjunction with other indicators to setup actual trading strategies. These indicators alone should not be used as trading strategies. After we discuss these indicators, we will layout 3 strategies that combine MACD + Other Indicators that build actual trading strategies. When the MACD Line crosses above the Signal Line, this is a bullish signal line crossover and signals a potential increase in stock price. 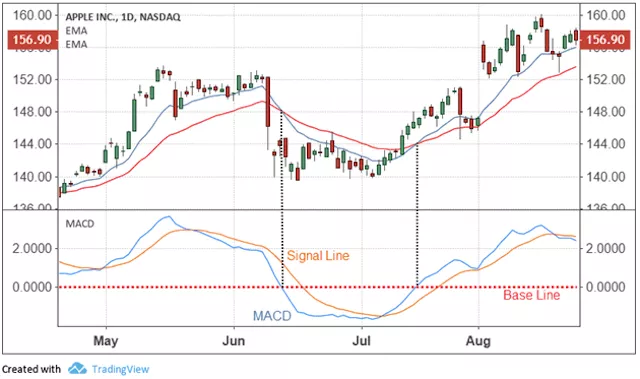 When the MACD Line drops below the Signal Line, this is a bearish signal line crossover and signals a potential decrease in the stock price. When the MACD Line drops below the Base Line, this is a bearish zero line crossover (or base line crossover). When the MACD Line crosses above the Base Line, this is a bullish zero line crossover (or base line crossover). Divergence occurs when the MACD Line and the actual stock price do not agree with each other. Bullish Divergence forms when the stock forms a lower low and the MACD Line forms a higher low. The stock’s lower low confirms the downtrend, but the higher low from the MACD Line signals less downside momentum. 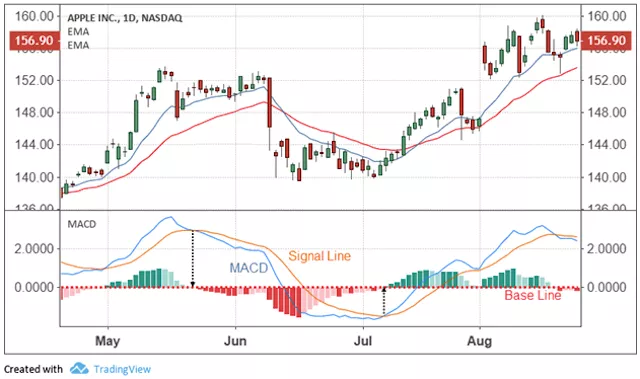 While the stock is still trending downwards here, the MACD suggests the downtrend momentum is slowing which foreshadows a trend reversal or upside rally to come. Analysis: the stock sets a lower low right at the Jul mark, while MACD sets a higher low. Thisis followed by a bullish run the ~$102 up to ~$113, before we see a bearish signal line crossover and subsequent pulback. Bearish Divergence forms when the opposite happens. The stock sets a higher high, and the MACD forms a lower high. The stock’s higher high confirms the uptrend, but the MACD signals less momentum on the upside, foreshadowing a soon to come trend reversall to the downside. Analysis: the stock sets a higher high at the Mar mark, where the MACD sets a lower high. We confirm the uptrend with decreasing momentum, which then soon reverses to a downtrend where the stock falls approx. 10% over the following month. Since we are day traders here and you likely are too, the 6-month charts above are probably too long term for us. With these strategies, we are going to show these trends on 10-minute and 60-minute charts to put what we learned above into practice. The Relative Vigor Index (RVI) is a technical oscillator that measures the strength of trends by analyzing a stocks closing price relative to its trading range. It is based on the simple theory that stock prices closer higher than they opened when a stock is in an uptrend, and close lower than they opened when in a downtrend. In this strategy, the MACD is used to confirm the trend momentum and strength of the trend, and the RVI will give us a better idea of whether the stock is overbought or oversold. The RVI overlay looks very similar to the MACD overlay with the exception of the histogram. With this strategy, we are watching for both a MACD crossover and an RVI crossover in the same direction to spot our entry point in the stock. We are then going to use only the MACD to determine our exit points. Analysis: This is a 60-minute chart. We have a dual downward cross in between the 7 and 8 marks on chart. The MACD cross signals a downward trend while the RVI makes the same downward cross. You would then close out of the position when the MACD crosses back up above the Signal Line, marked by the first red circle on the graph. Over this chart, there are 2 short positions that could be entered into, and one long. If you followed the indicators and entered on the double cross, and exited on the single MACD cross, you would have captured a profit of $3.86 per share. Not bad! If you don’t already love exponential moving averages, you will after this one. TEMA is the Triple Exponential Moving Average indicator. TEMA smoothes out three different EMA’s to provide an additional layer of validation along with our MACD indicator. The TEMA indicator, on the chart, is layered over the candlesticks. Here we are looking for the stock price/candlestick to break above the TEMA line, and the Signal Line to cross up and over the MACD Line. Analysis: This is a 10-minute chart and a 50 period TEMA. Using the longer periods for the TEMA captures only the big moves and reduces the amount of signals we see – we only want to focus on the big ones. As you can see, the Signal Line crosses over the MACD line at the same time the stock price is breaking above the TEMA line. The stock breaking the TEMA line is a bullish move, and we validate this move by seeing a Signal Line crossover MACD. We close this position out when the reverse happens and we see a reverse crossover of MACD. Approx. 5 hours later we get the close signal, which results in a profit of $0.75 per share. Our last trading strategy uses MACD in conjunction with the Awesome Oscillator. The Awesome Oscillator (AO) is a boundless oscillator that is the difference between the 5-period simple moving average (SMA) and the 34-period simple moving average. With this strategy we are only going to enter upon a MACD signal, confirmed by the AO, and the same for exiting. This strategy is slightly more difficult in that most of the time we only receive one signal for entry and exit, with no real confirmation signal. Analysis: This is a 60-minute chart from Boeing. The two green circles mark first, the MACD crossover signal, followed a few days later by the AO confirmation. However, a day or two later we receive a contrary signal from the AO, but because the MACD didn’t have a true crossover, we hold our long position. Over the next three trading weeks, the MACD has some small crossovers, but the AO histogram is tall and positive so we hold our position. We get our first sell signal, a MACD crossover on the 15th, and then get the confirming AO signal on the 19th, which is when we close out the position. $6.18 per share on this 3-week long position. MACD works on whatever time frame you are analyzing and trading. It is effective regardless of daily or intraday charts which makes it a good technical indicator for day trading. One thing to keep in mind is volatility really kills the use of MACD. High volatility decreases the accuracy of the indicator which is why it is best used when stocks are range bound or trading sideways. Also, MACD is dependent on the actual prices of the stock, which means it is not comparable to other stocks. A $10 stock will show different MACD ranges than a $100 stock will, so you cannot use it to compare two stocks against each other. One downside of the MACD is that short-term and small divergences are a lot more common that long-term strong divergences. This means you can get caught trading small swings that aren’t very profitable, so you need to focus on and try to filter out the big divergences. Become a StackedBid Pro Member today.